It took me a while to decide what to write in my review for this book and how to rate it. As you will see, I went for three stars in the end and here's why. When I saw this novel on NetGalley I was keen to request the ebook ARC because Joan of Arc is one of those figures in history that really fascinate me. I have read non-fiction books about her, seen films and musicals and so I was excited to see what this novel would bring to the table. On the whole, I liked it. It came across as well researched yet didn't get bogged down in historical detail and Cutter's prose was very readable and flowed nicely making it an easy, relaxing read. The reason it got three stars and not four though was the fact that I just never really connected with Jehanne. I wanted to like her, wanted to be drawn into her story, but it just never happened and I felt at a distance from the character from start to finish. At times she even began to annoy me. But, despite this, the book was enjoyable overall and I can recommend it for fans of historical fiction. Arc Center here in Albuquerque, New Mexico. I have been studying the life and times of Saint Joan for more than 40 years. Over this period of time I have easily read 90 biographies and histories written by reputable historians and theologians. 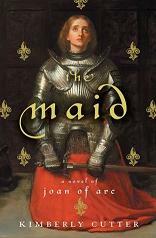 Although Ms. Cutter’s latest novel entitled, “THE MAID” is technically well written, from an historical point of view, the ‘Joan’ she created NEVER EXISTED.